If you have termites, you’ll find them dead within a few hours – almost certainly overnight. Because termites often shed their wings, you should also find wings around dead termites. If you have ants, you’ll find the ants to still be alive and, of course, with no wings. This is because, ant swarmers live for a very long time – up to a week or more! I’ve had specimens stashed in a test tube on the dashboard of my truck that lasted almost two weeks! Alternatively, for those who are a bit squeamish over sampling live unidentified insects, there is a quicker method! Just check where the infestation is coming from and look for evidence (or no evidence) of shed wings! A species of termite has been found to inflict more damage on its enemies as it ages. When defending their colony, some termites “explode”, releasing chemicals that injure intruders. A previously unknown crystal structure has been discovered that raises the toxicity of their chemical weapons. As worker termites grow older, they become less able to perform their duties. Yet this newly discovered structure allows ageing workers to better defend their colony. The research was published today in Science. 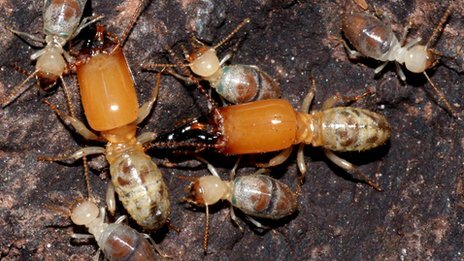 When faced with a threat, many termite species employ a type of altruistic suicide known as “autothysis” in order to deter attackers. In a few species, workers join “soldier” termites in the defence of their colony and perform these acts of suicidal defence. However, a twist to this system has been discovered in a species from French Guiana. “My PhD student, Thomas Bourguignon, was studying termite community ecology and collecting species when, casually, he found something really special,” Prof Yves Roisin from the Free University of Brussels told BBC News. By rupturing their bodies, Neocapritermes taracua release a toxic chemical that sticks to intruders, holding them fast and corroding their bodies. “[Autothysis] is usually a one component system. The defensive secretions are stored in salivary glands, but in these species there is a ‘backpack’ with two crystals carried outside the body. When the termite bursts, the two mix together, producing the more toxic compounds,” Prof Roisin explained. The “backpacks” are formed from pouches on the outside of the body. 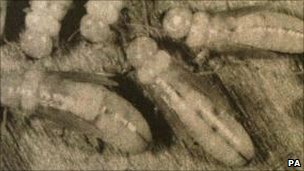 Although termite societies contain castes of “soldier” individuals with vastly enlarged mandibles that have evolved for the purpose of attacking intruders, workers can join fights and perform defensive suicides should the need arise. The research shows that as workers in this species grow older and more incapable of performing other tasks, they store up crystals that produce a chemical reaction when mixed with glandular secretions. This increases the toxicity of their explosive defence mechanism. Biologists believe it allows the ageing workers to become more “useful” to the colony as sacrificial, defensive bombs. How the crystals are synthesised is, as yet, unknown. Also unknown is whether other species in the genus have evolved a similar backpack system. “There are some five or six species in the genus, but it’s the only species [that carries a backpack] we’ve seen so far,” Professor Yves Roisin said. Staff at the bank, in the state of Uttar Pradesh, are reported to have been found guilty of “laxity”. The insects are believed to have chewed their way through notes worth some 10 million rupee ($225,000/£137,000). A similar incident happened in 2008, when termites in Bihar state ate a trader’s savings stored in his bank. The State Bank of India says an enquiry into the latest incident has been held. The State Bank of India has warned staff to be alert for money-grubbers “Action will be taken against those responsible in the matter. “As it was the bank’s fault, it will bear the loss caused due to termites… there will be no loss to the public.” Ms Singh said that identity numbers on the majority of the notes were still intact, which meant that they could be replaced. Bank officials discovered that the notes – which were kept in a strongroom – had been damaged by termites earlier this month. 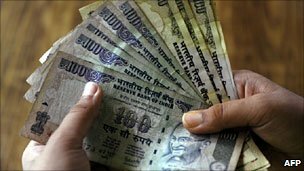 Ms Singh said that directives had now been issued to all branches that stored currency in strongrooms to ensure that the condition of the cash is checked every two months. Reports say that the branch where the money was stored was old, seldom properly cleaned and known to be a haven for termites. In the incident in Bihar in 2008, trader Dwarika Prasad lost his life savings after termites infested his bank’s safe deposit boxes and ate them up. Mr Prasad deposited currency notes and investment papers worth hundreds of thousands of rupees in a bank safe in the state capital Patna.